Harry Potter and the Goblet of Fire is a 2005 fantasy film directed by Mike Newell and distributed by Warner Bros. Pictures. It is based on the 2000 novel of the same name by J. K. Rowling. 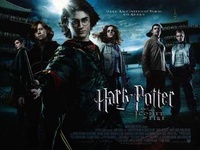 The film, which is the fourth instalment in the Harry Potter film series, was written by Steve Kloves and produced by David Heyman. The story follows Harry Potter's fourth year at Hogwarts as he is chosen by the Goblet of Fire to compete in the Triwizard Tournament. This webpage uses material from the Wikipedia article "Harry_Potter_and_the_Goblet_of_Fire_%28film%29" and is licensed under the GNU Free Documentation License. Reality TV World is not responsible for any errors or omissions the Wikipedia article may contain.